filtration driving force. The hydraulic conductivity of the filtration barrier and the surface area of the filtering capillaries determine Kf. • Renin is released from the juxtaglomerular cells by a fall in blood pressure or by neural and hormonal signals that indicate a decrease in extracellular fluid volume. Renin catalyzes the cleavage of angiotensin I from circulating angiotensinogen. Converting enzyme catalyzes the conversion of angiotensin I to its active circulating form, angiotensin II. • Angiotensin II has three major effects: (1) It acts systemically as a pressor to increase blood pressure; (2) in the proximal tubule, it increases salt and water reabsorption; and (3) it stimulates the adrenal cortex to secrete aldosterone, which increases Na+ reabsorption and K+ secretion in the distal nephron. • Because of intrinsic renal autoregulation, RBF and GFR remain constant over a wide range of fluctuations in the systemic blood pressure. Autoregulation involves a myogenic mechanism and tubuloglomerular feedback. The two kidneys are supplied with massive blood flow in comparison with other organs. In the young healthy adult, the renal blood flow (RBF) ranges from 1000-1200 mL/min, or ~20% of the resting cardiac output. At a hematocrit of 0.40 to 0.45, the renal plasma flow (RPF) is about 670 mL/min. Because the metabolic cost of the many transport processes that are constantly occurring in the nephrons is considerable, the kidneys, despite their small mass, account for ~8% of the total body oxygen consumption. Nevertheless, the very high blood flow rate is far in excess of that needed to meet these metabolic demands, resulting in the small difference of 1.7 mL/dL between the oxygen levels in arterial and venous blood. Instead of merely supplying oxygen and metabolic substrates, this large rate of blood flow is required to produce the high rate of glomerular filtration needed for excretion of metabolic by-products such as urea, uric acid, and creatinine. Glomerular filtration, the initial event in the formation of the urine, results in the movement of a large volume of fluid from the glomerular capillaries into Bowman's space. Most solutes that are smaller than proteins pass freely across the glomerular membranes, and thus glomerular filtration results in the production of an ultrafiltrate of the plasma. This ultrafiltrate contains very little protein, but has approximately the same concentrations of the smaller solutes as plasma. Reabsorption is the regulated transport of water and solutes from the urine to the blood that occurs along the nephrons. 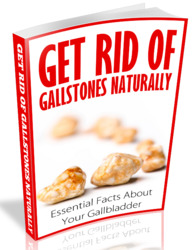 Given the high rate of filtration, solutes that are to be removed from the body can be excreted in large amounts merely by a failure to reabsorb them along the nephron. on the other hand, the high rate of filtration imposes a high energy cost in order to reabsorb those ions and metabolic substrates that must be conserved by the body. Filtration and reabsorption are functions not only of the nephron; they are coordinated with the unique properties of the vasculature. Ultrafiltrate is formed from the glomerular capillaries, but solutes and water that are reabsorbed from the nephron must be returned to the circulation by uptake into the peritubular capillaries. The same Starling forces that apply to all capillary beds govern the movement of fluid into and out of the renal capillaries. However, the series arrangement of two capillary beds in the kidney is unique. 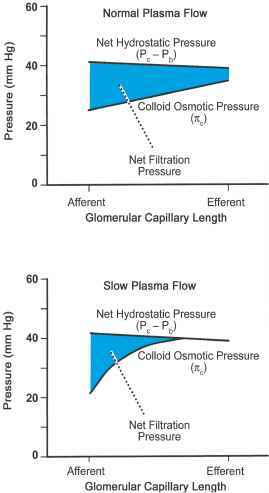 The high hydrostatic pressure in the capillary network of the glomerulus produces rapid net filtration of fluid, whereas the higher colloid osmotic pressure (COP) and lower hydrostatic pressure of the peritubular capillaries allow for net fluid uptake. The importance of these functions is reflected by a phenomenon referred to as autoregulation, which permits glomerular filtration to be maintained relatively constant over a wide range of systemic blood pressures and despite other extrarenal changes. Autoregulation depends primarily on alterations in the resistance of the afferent arteriole in response to such external factors. However, changes in glomerular filtration rate away from the autoregulated set point can also be produced in response to certain physiologic stimuli by neurally or hormonally induced changes in the resistance of the afferent and efferent arterioles. This chapter describes the basic mechanisms involved in the regulation of blood flow, glomerular filtration, and peritubular capillary uptake in the kidney and how these processes may be altered under normal as well as pathologic conditions.